Trust in the Lord with all your heart And lean not on your own understanding In all your ways acknowledge Him And he will make straight your paths Proverbs three five and six. There was a little turtle (put hands together in a fist) He lived in a box (make a box with both hands) He swam in a puddle (make swimming motions) He climbed on the rocks (use your fingers to climb up your arm) He snapped at a mosquito (clap hands) He snapped at a flea (chomp with your mouth) He snapped at a minnow (clap hands) He snapped at me (Do Home Alone Face) He caught the mosquito (grab with your hand) He caught the flea (grab with your hand) He caught the minnow (grab with your hand) But he didn't catch me (jump in excitement)! For fun, we made Timothy the Turtle Roll and served it with Tawny Scrawny Lion Creamy Carrot Soup. 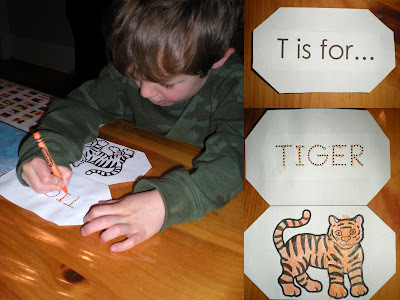 Each lesson includes a quick review, phonemic awareness, phonics skill, vocabulary words, letter formation (I teach this but do not enforce it at this point) and writing practice (mostly he chooses to do all the writing, but I do not make him. Occasionally, I will suggest he just tell me the answer and then I mark the page as completed with a star), listening to instructions and following directions (I do make it a point to make sure he follows directions and then let him do as he chooses - for example, it may say to mark the correct answer, but then I let him color it also), building fluency (modeling left to right reading and appropriate expression), building comprehension (extending word knowledge and understanding text), and reinforcement activities (all the fun stuff we do). Vocabulary words from this lesson include turtle, televsion, tail, toe, toaster, telephone, toothbrush and tent. 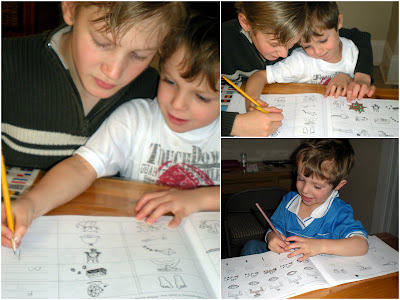 Each lesson includes review from all the previous letters learned. I picked up this magnetic board to help with review. 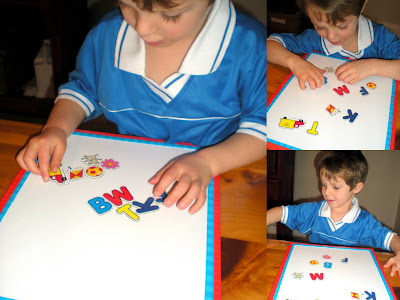 I gave him the letters he has learned and objects that begin with those letters and let him match them up. 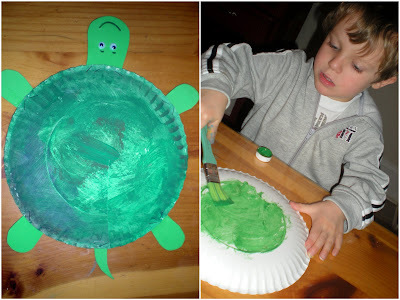 This cute turtle craft is from Alphabet Art. 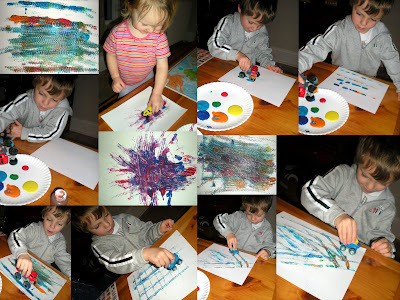 This was a great hand eye coordination project! He had to wrap the tissue around the end of the pencil, and then stick it onto the paper T. He thought it was pretty neat how it turned out! Some paper, paint, and vehicles with interesting tread made for one fun project! I let Mali and Elli drive their trucks in the paint and on the papers. It made really neat designs on the paper! 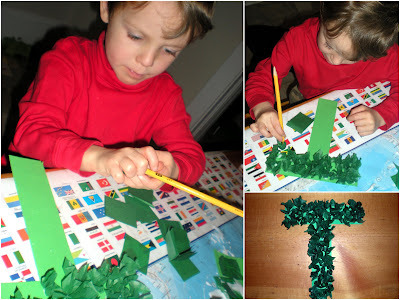 I got the idea to use toothpicks to make letters at Our Homeschool Creations. 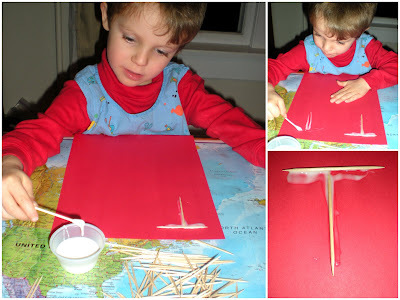 Toothpicks make easy capital T's! 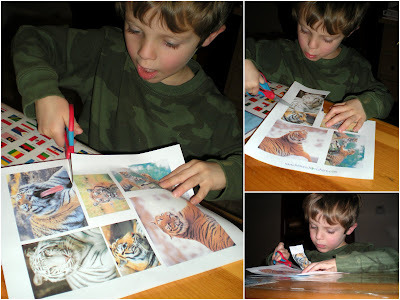 I read All About Tigers to Mali while he cut out pictures of Tigers. He told me he was making a puzzle. 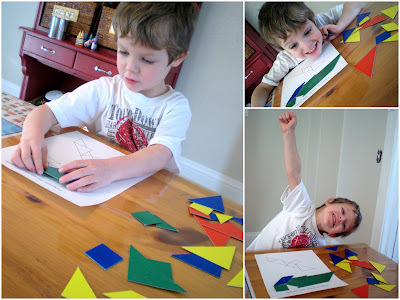 I found this cute Tangram Turtle online and Mali loved the challenge! 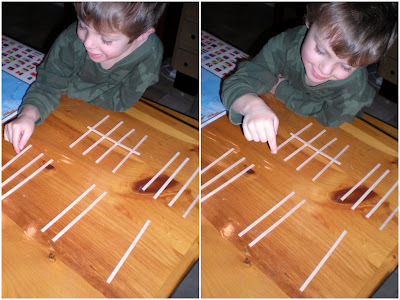 Here we are counting with Tally sticks. 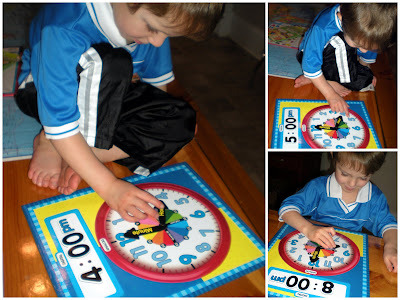 We counted to 5 and then 10 with the sticks. 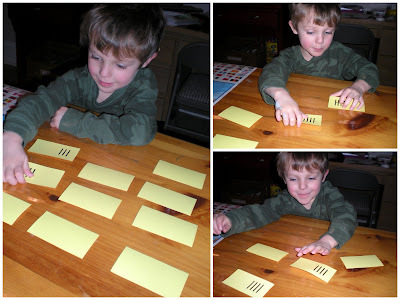 After he understood what Tally counting is, we played a memory game with Tally cards that I printed from the book, Math Card Games: Games for Learning and Enjoying Math, by Joan A. Cotter. He l.o.v.e.d. this! He played it again and again, by himself or with anyone who was available to play! I know I'm only 6 months or so behind... but I will be using some of your T ideas in a few weeks!! Thanks for the awesome ideas! Down and Over and Down Some More . . .